I love it. Just beautiful color combination. These colors *are* beautiful! I have really been loving yellow this past year or so. It was my favorite color growing up but then I thought it was blah but now I love it again! I love zinnias! Gorgeous colors! A perfect summer combination of colors! Amazing ! Such a beautiful pallette of colors. What a beautiful photograph! I love the colors. Yes, the colors in this picture are fabulous! This came out great and I love the color bar template you used with it! Gorgeous!! SUCH happy colors all around. Beautiful! I love all those colors together! very nicely expressed and explained. you are closing in on 500 followers! Whoohoo! 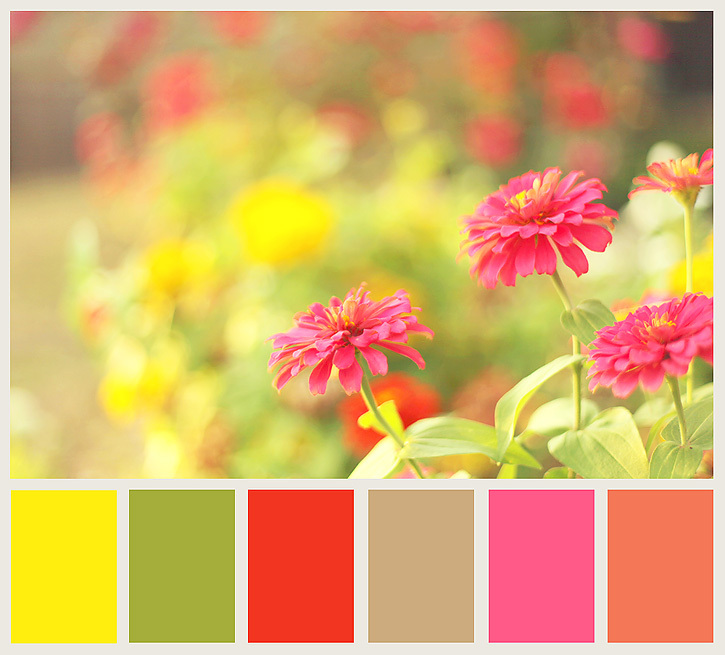 What a lovely color palette - who would have thought that orange and pink would go so well together. I LOVE Zinnias and I first discovered them this year, haha. We bought a big package of wild flowers and sprinkled them all over our flower garden, now we have HUNDREDS of zinnias. They are my new favorite flower!